David and Cheryl Kagan are holding a concert in the round to launch their sixth year of concerts in their home. Cletus Kennelly (above) will be a featured artist. Silver Spring singer-songwriter Cletus Kennelly been asked to perform in many unusual places: basements, attics, the deck of a buddy’s 70-foot schooner on the Magothy River. A group of naturalists wanted him to headline once – and he didn’t say no, but nothing ever came of that. So you’d think he’d take house concerts in stride. ‘‘I found it kind of odd at first,” admits Kennelly, whose CDs include 2005’s solo ‘‘Thread” and ‘‘Lotus,” made in 2007 with Lori Kelley. ‘‘This antiquated thing that people used to do. House concerts are small, medium or large get-togethers held by music fans in private homes. These are open to the public; attendees call or e-mail for reservations and directions, and when the suggested donations are collected, the money goes straight to the performers. 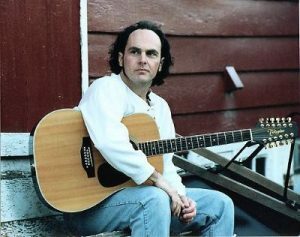 A Montgomery County native, Kennelly attended his first house concert a dozen years ago. It was Tom Prasado-Rao playing at the Panzer House Concert, he says. Now, as a performer, he sees the benefits of performing in the home of a music lover. There’s one house on the street where all the music plays – and in this Rockville neighborhood, it’s the house where David Spitzer and Cheryl Kagan live. To make it up to them, Kagan and Spitzer decided to celebrate their sixth season of house concerts with a concert featuring Kennelly plus Julie Clark and Jerry Bresee. ‘‘This house concert is generally nationally touring acts,” Kennelly says. ‘‘And local people get to be opening acts. As in, the local acts that house concert audiences most wanted to see. Clark, a Virginia-based singer-songwriter, is thrilled to be part of the lineup. ‘‘House concerts are really as good as it gets,” she exclaims. ‘‘There are no pretenses. The walls are down; it’s intimate. So much so that she’s flown as far as Portland, Oregon, to do a basement gig. What’s the appeal? Clark says that because she writes her own songs, being physically close to the audience enhances the emotional closeness her music tends to inspire. ‘‘Cheryl’s format is a great approach,” Clark says, referring to the three solo sets followed by intermission and a musical round robin. ‘‘Initially they get to meet me and hear my songs – standalone. Kagan says the house concert area – a bright, spacious walkout basement – seats 60 folk fans. She also says that concerts in the Folk ‘N Great series tend to sell out quickly. Not surprisingly, those two facts make performers especially eager to play there. What’s more, the easygoing vibe allows the musicians to get feedback from the audience they might not ever hear in an anonymous venue. Fully clothed, on dry land, and face to face with an appreciative audience: Who could ask for anything more? Jerry Bresee, Julie Clark and Cletus Kennelly perform in-the-round at a Folk ‘N Great House Concert at 8 p.m. Saturday in Rockville. Doors open at 7:30 p.m. A $15 minimum donation is recommended. 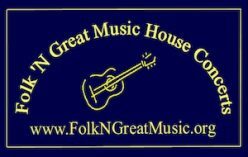 Visitwww.FolkNGreatMusic.org.